This painting is full of significance and history. Franz Marc made it in the Spring of 1913. It shows he is fascinated by the shape and spirit of horses, like in many of his works. With the rainbow a picture of cosmic unity has been created. Marc wanted to express the world of nature through the eyes of horses and other animals. Between 1911 and 1914 he made a wealth of pictures in which the soul of animals dominate and abstractions are developing. In 1911 Wassily Kandinsky and Franz Marc organized their own exhibition in Munich under the name Der Blaue Reiter (The Blue Rider) and their Almanac with this title. Marc was killed in 1916 near Verdun. 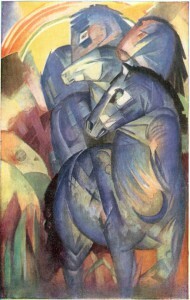 The Nationalgalerie in Berlin acquired the Tower of Blue Horses in 1919 as a recognition of his important artistic value. In 1937, however, the Nazis removed it as ‘entartete Kunst’ (deranged art), but Reichsmarschal Hermann Goering included it in his private collection in Berchtesgaden. There it was still seen in the summer of 1945. Since then it has disappeared.